Planning a full scale office relocation, but don’t want to leave anything to chance? If that is the case, then you have made the first step to a successful completion of the project. Taking the guesswork out of office relocations is the single most important aspect of the process, and planning everything down to the smallest detail will make all the difference. Usually though, even well prepared business owners can use with some specialised assistance during their office relocation. If you can use with some professional advice and the right technical expertise, then we, at Harringay Office Removals, can provide you with the right type of service at the right price. The company has the required technical capacity, industry experience and manpower to organise and carry out successfully a wide range of office removal solutions and guarantee customers cost effective servicing and timely completion of the job. Timely completion is one of the most essential aspects of office removals, as failing to vacate the current properly timely can translate to penalty fees for the owner. On the same note, timely completion of the office removal means less downtime for the business and fewer lost profits and unhappy customers. We can cover all bases and ensure your office removal goes according to plan and schedule. With us, there will be no costly delays or errors, as the entire removal will be overseen by a qualified logistics specialist, who will walk you through each step of the process and explain why and how we do things. Should you have any additional requirements or concerns about the office removal, please be sure to discuss those with our relocation specialists. Households and businesses in N4, N8 and N15 areas of Harringay can turn to Official Removals for high quality moving solutions without the high costs. We focus on efficiency and value for money. Our clients receive fully comprehensive service which deals with every stage of the removal from start to end. Services we offer can be modified as per individual needs and wants. Additional options like packing, storage, tenancy cleaning, junk disposal etc. can also be included in the removal. Harringay Office Removals works with specially trained, professional movers, as we need to make sure your office contents and equipment is handled safely and delivered to your next destination damage-free and intact. Our diligent, well organised mover teams will take care of packing, securing and loading of your items as effective prep work is crucial for avoiding damage or misplacement during handling and transportation. We provide flexible week round servicing, with convenient booking hours. Harringay is a suburb within the Borough of Haringey, North London. 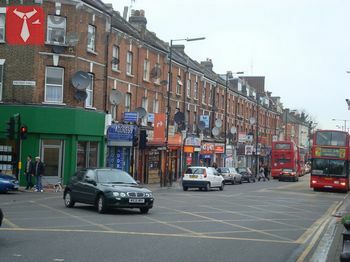 The area is served by a long, well stocked high street (Green Lanes) which offers decent quality shopping and dining (mostly Turkish). The modern day suburb developed from an ancient settlement.